Unsurprisingly, the big news among high frequency indicators was the further upwarrd spike in interest rates. March was revised up by +34,000, butApril was revised down by -2,000, for a net change of +32,000. The more leading numbers in the report tell us about where the economy is likely to be a few months from now. These were virtually all positive, or at worst neutral, after 3 negative months. the average manufacturing workweek was unchanged at 40.7 hours, but April was revised down -0.1. This is one of the 10 components of the LEI and so will affect it negatively (for April). construction jobs rose by 17,000. YoY construction jobs are up 273,000.
manufacturing jobs rose 7,000, and are up 175,000 YoY. Professional and business employment (generally higher-paying jobs) rose 64,000 and are up 673,000 YoY. temporary jobs - a leading indicator for jobs overall - rose by 20,100.
the number of people unemployed for 5 weeks or less - a better leading indicator than initial jobless claims - decreased by 311,000 to 2,418,000, compared with December 2013's low of 2,255,000. Overtime was unchanged at 3.3, from an upwardly revised April. the index of aggregate hours worked in the economy rose 0.3 from 103.0 to 103.3.
the index of aggregate payrolls rose by 0.6% from an upwardly revised 123.0 to 103.3.
the alternate jobs number contained in the more volatile household survey increased by 189,000 jobs. This represents an increase of 2,833,000 million increase in jobs YoY vs. 3,058,000 in the establishment survey. Government jobs increased by 18,000.
the overall employment to population ratio for all ages 16 and above rosse +0.1 59.4%, and has risen by +0.4% YoY. The labor force participation rate also rose 0.1% fr om 62.7% to 62.9% and is unchanged YoY (remember, this includes droves of retiring Boomers). This was an almost perfect report. Almost everything moved, significanlty, in the right direction. About the only negatives were an increase in part time for economic reasons employment, and a slight increase in the unemployment rate, but that was due to an increase of people entering the workforce. Last month the leading portions of the employment report were sounding an alarm. This month that was all reversed. Only the continuing decrease in mining jobs, -65,000 so far this year, demonstrated the continuing effects of the very strong dollar on exports, but this was swamped by the positive news everywhere else. So the takeaway from this report is that the consumer expansion is outscoring the shallow industrial recession. 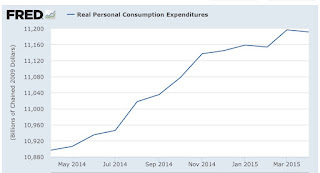 In addition to poor industriall production, that appears to be a matter of an overly strong US$, the other part of the US economy that has failed to grow this year is consumer spending, particularly as measured by real retail sales. Several months ago I looked at state sales tax receipts as a proxy for consumer spending, and concluded that the very harsh winter was responsible for poor sales at the beginning of this year. I updated the analysis one month ago, suggesting the effects of winter had passed, and the continuing weakness was an Oil patch phenomenon. The latest information, through April, indicates that continues to be the case. Note that the actual sales may have taken place in the month before the revenue was remitted to the state. The epicienter of poor winter sales numbers was New York and Massachusetts. That appears to have abated, at least in New York. In March, New York reported at +5.1% YoY increase in sales tax receipts. In April, the increase was +4.5% YoY. In January New York reported sales tax receipts up +4.2%, and in February they were actually down -0.3% YoY. As to Massachusetts, the record is more subdued. In March it reported a +1..9% YoY increase in sales taxes. In April that went down to +0.6% YoY. Campare that with than January's +0.6% YoY rate, and February's +0.2%. That's a huge slowdown, and almost certainly means month-over-month decreases, if we were able to seasonally adjust! At the end of June, the Census Bureau will report state by state retail sales for the first quarter. The evidence from state sales tax receipts is that it will confirm that the ongoing weakness in consumer spending is primarily an Oil Patch issue. The financial crisis and Great Recession have left a thick residue of anxiety. 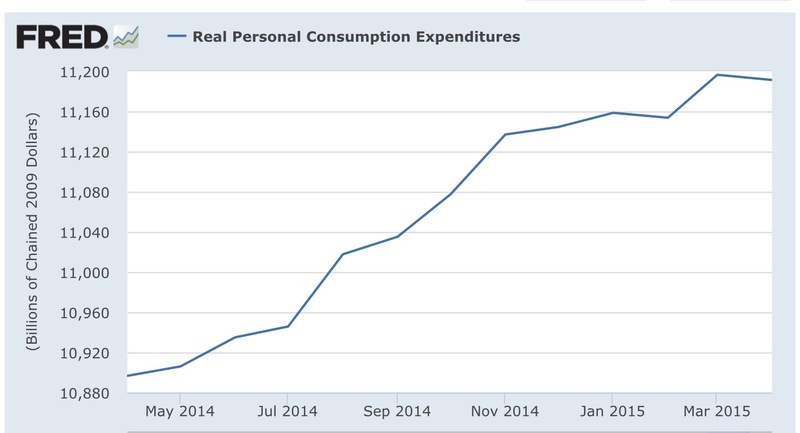 Companies and consumers responded by restraining spending, which (of course) weakened the recovery. The problem is that the data refuses to agree with his psychoanalysis. As I pointed out yesterday, consumption is actually higher as a share of GDP than it was before the downturn, indicating that fear is not keeping households from consuming in any obvious way. 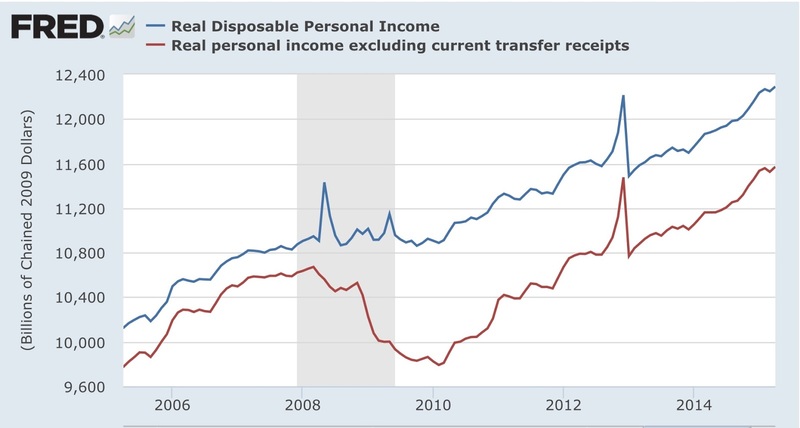 Respectfully to Prof. Baker, this morning's report on April income and spending shows that American households continue to demonstrate Keynes' paradox of thrift. This is why this year's "shallow industrial recession" shown in industrial production generally, and steel and rail particularly, hasn't spread to a recession in the entire economy. Simply put, Americans continue to save rather than spend thei money they are no longer spending to fill up their gas tanks. 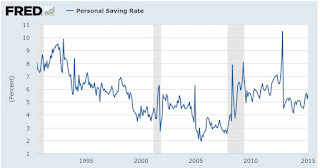 In the early 1970s, the personal savings rate was as high as 14%+. As the graph shows, it gradually decreased to 2% in 2005. It has been increasing secularly since. Note that the sudden decline at the beginning of 2013 marks the time when the temporary 2% reduction in Social Security withholding expired. Consumers responded not by cutting back, but rather by digging deeper into their savings. Since then, the increasing secular trend has reasserted itself. 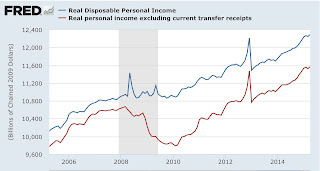 This is of a piece with the steep decline in household debt burdens that began with the Great Recession. So I think Samuelson is correct that the events of the last 10 years profoundly affected consumer psychology, leading to more cautious spending. That households are rebuilding their balance sheets is a good thing - in moderation - so long as it merely holds back growth a little and doesn't tip us back into recession. This morning the ISM manufacturing index for May was reported at 52.8, up from April's 51.5. This is a good timre to remind you that there has never been a recession when the ISM reading has been over 50. Fiurther, the index captures the indsutrial slowdown quite nicely, as it slid from 57 in Novmeber to the aforementioned 51.5 in both March and April. (I would show you this in a nice graph, but Apple's IOS 8.3 has destroyed my ability to upload new graphs to Blogger. Grrrrrr).